All Dividend Aristocrats have a top-notch dividend track record, but not all stocks are worth your money. The S&P 500 Dividend Aristocrats is the perfect hunting ground for income investors. The group, after all, comprises niche stocks that have increased their dividends for at least 25 consecutive years. But even within this enviable group, some stocks are better than the rest, while some are best avoided for better options elsewhere. To that end, our contributors believe you could easily pass on The Clorox Company (NYSE:CLX), Archer Daniels Midland Company (NYSE:ADM), and T. Rowe Price (NASDAQ:TROW) for better Dividend Aristocrats. Here's why. Tim Green (The Clorox Company): Clorox is a solid company with a stable of well-known brands. It's best known for Clorox bleach, but its other brands include Liquid Plumr, Pine-Sol, Brita, Fresh Step, and Glad, to name a few. The company isn't growing very fast, but high-teens operating margins and ample free cash flow allow it to buy back plenty of shares, boosting its per-share earnings. Clorox has increased its quarterly dividend each year since 1977. The dividend yield isn't all that high at about 2.4%, but it's still well above the yield of the S&P 500. The problem with Clorox as a dividend stock, though, is the valuation. Clorox produced $4.92 in GAAP earnings in fiscal 2016, putting its price-to-earnings ratio at a little over 27. That's awfully expensive for a company growing as sluggishly as Clorox. Paying a premium for quality makes sense, but paying nearly 30 times earnings for a company that is driving most of its earnings growth via share buybacks seems excessive. Clorox isn't a growth company, yet it's being valued like one. While I appreciate the long streak of dividend increases, I can't justify paying such a high price. Neha Chamaria (Archer Daniels Midland Company): When I'm looking for dividend stocks, I'm generally wary of one with fortunes tied closely to uncontrollable macro factors. Archer Daniels Midland is a perfect example. As a processor and seller of agricultural commodities, ADM's profits and cash flows can be very volatile, as they're subject to unpredictable farm fundamentals. You just have to see the trend in ADM's key operating metrics in recent years to know what I mean. ADM Net Income (TTM) data by YCharts. Now that doesn't look too appealing, does it? Of course, it's commendable that ADM has still managed to increase its dividends every year since the beginning of the decade, but those increases haven't been too impressive, either. Its last two dividend increases have been 7% each. ADM's dividend yield of 2.8% isn't among the best, either, and the stock has returned only about 10% in the past three years on a total returns basis versus the S&P 500's 27% return. Here's another worrisome statistic from ADM's books: Its free cash flows dipped to $593 million last year from over $4 billion each in 2013 and 2014. That's how challenging the agri-business can be. 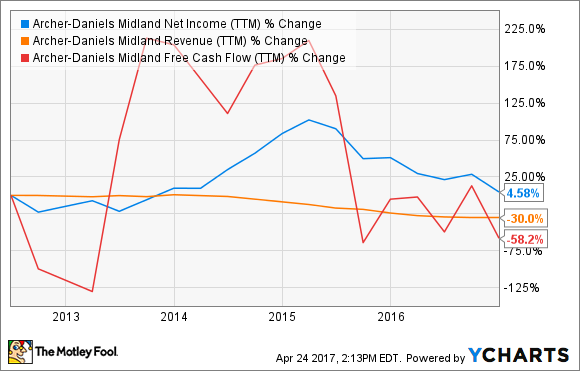 As another potential red flag, ADM's dividends overshot its free cash flow last year, which is why I'd avoid ADM and shop elsewhere for stronger dividends. Jordan Wathen (T. Rowe Price): If you asked me four years ago, I would have never named T. Rowe Price as a Dividend Aristocrat I would avoid. Today, though, I think it's becoming clear that the future for asset management calls for more passive funds (indexes and ETFs) and fewer actively managed mutual funds. The best days for an active manager like T. Rowe Price are likely in the rearview mirror. With about $810 billion of assets under management (AUM), the company generates the bulk of its revenue and earnings from management fees on $450 billion of equity strategies, which typically carry a higher fee than bond strategies. Importantly, T. Rowe Price has been most successful as a manager of U.S. stock funds, which I believe are most exposed to the risk of losing assets to lower-cost index fund products. In 2016, the company collected an average fee of 0.48% on all AUM, stock and bond, domestic and international. When I compare that to sub-0.10% expense ratios of a myriad of passive funds, I wonder for how much longer its clients will be able to justify paying at nearly five times more for a product where the expected result is a return less than lower-cost substitutes. By their nature, active funds tend to hold more cash, trade more frequently, and charge higher fees, creating a drag on their clients' returns relative to passive funds and ETFs. I can't dispute T. Rowe Price's historical record or history of dividend growth, but I think the future will look very different from the past. When the fortunes of an entire industry deteriorate, there is little that separates the best companies from the worst.